Structure and properties of low-alloyed copper-based alloys with Cr, Zr and Hf after severe plastic deformation (SPD) using techniques of high pressure torsion (HPT) and equal channel angular pressing (ECAP) have been studied. SPD significantly increases strength of the alloys by formation of ultrafine-grained structure. Cu5Zr and Cu5Hf particles suppress the grain growth in ultrafine-grained (UFG) structure more effectively than the Cr particles and provide additional hardening during aging. Moreover, it was found that the application of additional aging after SPD significantly improves service properties of the alloys (fatigue limit, wear resistance and electrical conductivity). This combination of properties results in a high durability of electrodes for resistance spot welding produced from UFG Cubased alloys. Graphene (GR), a single-atom-thick sheet of hexagonally arrayed sp2-bonded carbon atoms, is close to become the next disruptive technology, replacing some of the currently used materials and leading to new markets. The contribution will focus on the production, characteristics, and current and prospective applications of this new carbon nanomaterial. Combustion synthesis (CS) is proposed as a novel approach to produce GR-related nanomaterial. Especially in recent times, many studies have been performed on cementitious mortar materials to have different properties. Some of these studies include the production of different building materials to reduce the harmful effects of devices emitting electromagnetic and radioactive waves used at industrial scale. For this purpose, in this work, chromium steel shavings in metallic character obtained during metal machining processes, were used in cementitious mortar mixes by replacing with limestone fine aggregate in a certain ratio. These mixes were tested to examine their physical and mechanical properties. The findings were compared with those of control specimens. With the inclusion of chromium steel chips, bulk density, apparent porosity, water absorption and capillarity of the mortars increased while flexural and compressive strength decreased. In the present study the influence of the monitored type iron powder, and the process of sintering in the presence of a liquid phase on the tensile strength of the powder metallurgical samples of the system Fe-C-Cu . Research samples are subjected made of three types of iron powders – ASC 100.29, SC 100.26 and NC 100.24. Thereto is added of 0,2 to 0,8% carbon and 2,5% copper. After sintering the measured density of the samples in the range of 6,20÷7,00g/cm3. Are presented graphics, amending the tensile strength of the samples depending on their density and the concentration of copper and carbon in the iron matrix. In this research work are presented results of investigation properties of explosive welded joints (bondings) between structural steel and high alloyed materials. As base material was used SA 516 Gr 70 structural steel, while AISI 316L austenitic stainless and nickel base alloy Inconel 825 were used as cladding materials. Performed investigation can be divided as investigation of plates for welding before explosive welding and investigations of welded joints after performed welding. Chemical, mechanical (tensile testing, shear testing, hardness measurement and impact toughness) and microstructural investigations were performed of base metal plates. Welded joints were investigated after heat treatment of cut pieces from welded plates and chemical treatment of bended specimens in acid solution. Obtained results from testing were compared with the standard requirement. Generally, obtained results correspond pretty well with standard requirement. The motion of a dislocation in Aluminum is considered at room temperature with allowance for the Peierls relief. This study has been accomplished using the methods of mathematical modeling. It was shown by means of numerical experiment that the free path length of dislocation depends on the frequency of applied external elastic field. Here a hardening of crystal took place due to the dynamical losses. In the presence of resonant frequency external alternating elastic field the gradient of hardening curve growth, and therefore, the yield strength, is reduced. It was shown that the regularities of large-scale processes occurring in deformable body may be clarified by means of analyzing the micro processes. In this paper I present a research based on technological problem encountered in the machining parts specific aerospace industry made from aluminum alloy extruded profile with length up to 6 meters. Those parts have very tight tolerances, during milling process appear several factors that influence the repeatability of machining processes. The effect of filler concentration of the powder mixture (Ti-TiC-C), synthesized by high-voltage electric discharge (HVED), on the thermal and mechanical properties of epoxy composites, was studied. Basing on the value analysis of destructive stresses in bending (σ), Young’s modulus (E), resilience (W) and heat resistant by Martens (T), a range of powder mixture (Ti-TiC-C) concentration, which allows to increase thermophysical and mechanical properties of epoxy composites for manufacturing equipment in conditions of alternating loads was set. 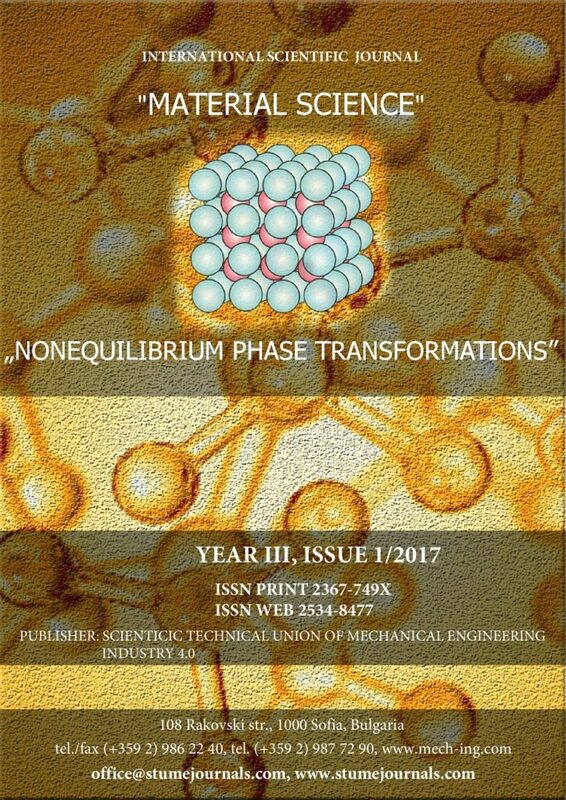 Development of new alloys has been slowed by the empirical method of trials and errors that absorbs more and more resources and leads to ever smaller results. Solution of this problem is possible through the use of the general principles of the alloys design theory. In this paper, we have proposed to consider cast metal matrix composites as foundry alloys and have developed a methodological approach to selection of alloying and reinforcing components considering the operational conditions for parts of friction units. Application of the proposed approach allows to make reasonable choice of composite alloys components within conditions of various schemes of reinforcing, including exogenously reinforced, endogenously reinforced and complex reinforced alloys.